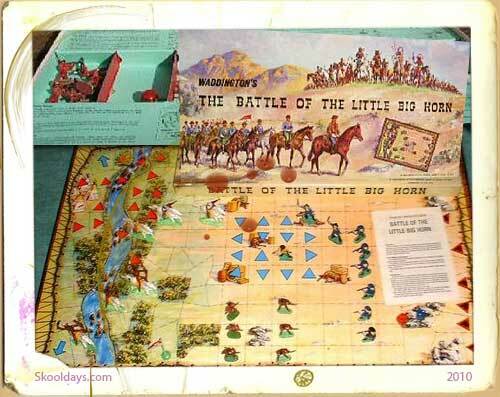 Anyone remember the Battle of Little Big Horn game by Waddingtons? In the 1970s i would often frequent several second hand gadget shops, this was a long time before car boot sales existed, though it was in the days of a good old fashion jumble sale. One of the local shops had an uncanny knack of stocking very unusual games on a regular basis. The Battle of Little Big Horn is no exception. Was it a board game. Or just a cowboys and Indians set? I’m not too sure if it came with any rules as i can only remember making up my own rules, but what ever the case it looked an awesome game. My set was made in 1963 by Waddingtons. As a kid it was more likely to be General Custard than Custer, that gives you an idea of my appreciaition of history! I can only imagine the purpose of the game was to relive the battle. The box claimed you can now re-live this historic battle, and you can plan your own strategy. Can you find a way to get Custer, or at least his flag, clear of the battlefield? The Battle of Little Big Horn is based on the history of the Sioux and Cheyenne Indians. There were getting upset with the prospectors pouring across North and South Dakota America. Chief Sitting Bull gathered a force, by the Little Big Horn river, just north of the Montana-Wyoming border, ready to strike. Three columns of US Cavalry were dispatched to subdue the Indians. Having done a little more research on this game of this battle of Little Big Horn, and appears very politically incorrect. Movements and terrain effects are similar to most current wargames. Horses move faster than foot units and wearing a gun enables some ranged attacks.According to the Wiki on this game: Winning conditions are different for the 2 opponents: Custer’s men can either eliminate all Native American riders or cross the Little Big Horn River and try to reach one of 2 winning spaces on the board, the Native Americans must eliminate general Custer and his 2 officers. This game provides huge memories and very little game play from my past. Do you remember playing this Battle of Little Big Horn game? I played with my eldest brother whose game it was but I never won,I barely understood what I was supposed to do and much preferred Battling Tops. I was around 10 years old,I think. Great memories on a great game – good to know others enjoyed the Battle of Little Big Horn game. Anyone still have all the rules in tact? 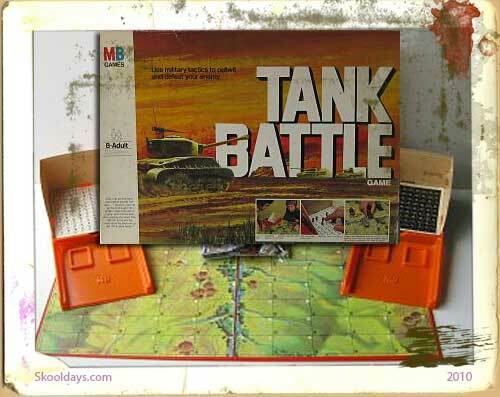 I think I remember that the rules were printed inside the box lid?